Bagels, Burritos and Tunes, Oh My! When I first started going to sessions, it was hard to imagine what it would be like to actually host one. To be the person in charge, who organizes it, sets the tone and somehow gets musicians to show up. It all seemed a bit overwhelming at the time. Let’s face it, if you’re a player, you just show up with your instrument, play your favorite tunes, enjoy a pint, some conversation and call it a night. But when you’re a host, it’s a slightly different experience. Last night I hosted the first of a weekly session at Bagitos, a bagel and burrito restaurant in Montpelier. It was probably the most fun I’ve had hosting a session, though I’ve really only hosted a few. 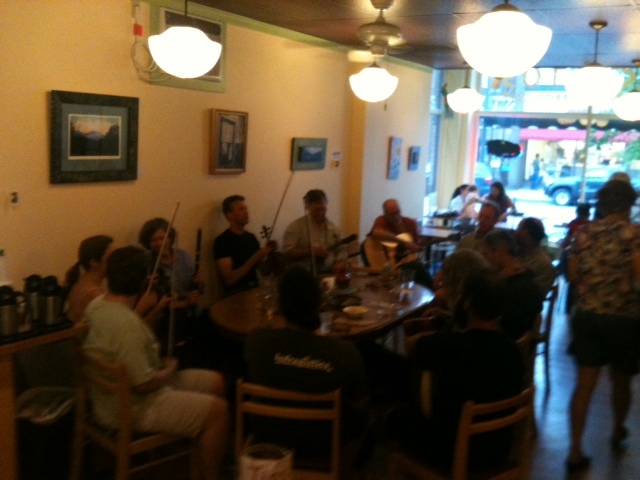 Although this is a new restaurant and was the first Irish session there, it went off without hitch. As you can see from the picture we all sat around the table, enjoyed some delicious burritos, drank some thirst quenching pints and played some great music. There was a moment when I looked around the table and was so touched to see all these amazing musicians that came down to play. The session takes place every Tuesday from 5:30-8pm at Bagitos on 28 Main Street in Montpelier. Come down early and eat some bagels and burritos and stay for some Irish tunes. Hope to see you there!